We’re into August and a highly anticipated week of TACO summer fun! We’ll gather on Sunday, August 5th from 2 to 5 pm at the LAYC to get comfortable with a set-list of familiar favorites. Our usual format including music and appetizers, we’ll play through 12 tunes and see what we can make of them. In typical orchestras this is called a “rehearsal,” but in our effort to take away any possible intimidating stress, we call this a fun TACO gathering! ORCHESTRA ON THE GREEN On Friday, August 10th at 6 to 7:30 pm. 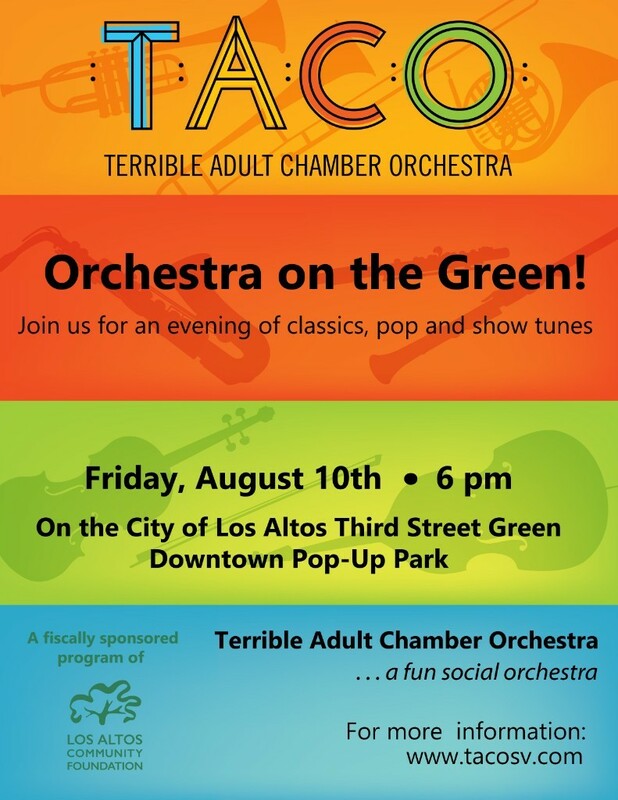 you can hear TACO play on the Third Street Green in downtown Los Altos. In “normal” orchestras this is called a “concert,” however, in our TACO-way, we’re calling this an outdoor musical gathering, a chance to play for friends and family, anyone else who happens to stop by to listen, all for the fun and joy of making music together. Bring folding chairs and blankets to enjoy the summer evening with us. MARISOL DE ANDA Twenty-two year old coloratura soprano, Marisol is a student at San José State University and is pursuing a degree in Vocal Performance. She is a winner in several competitions including the vocal award for Steve Silver’s Beach Blankey Babylon $10,000 Scholarship Competition in June of 2014. Marisol has traveled abroad to both Ireland and the Baltic states with the SJSU Choraliers and has been the soprano soloist for multiple works. This is her first appearance with TACO. JOHN SYLVESTER After a career as one of the owners of a local insurance brokerage firm, John continues to serve on the board of the Los Altos Stage Company and recently retired from the board of Music for Minors. He is a past president of Los Altos Rotary Club and continues as an active member. You can hear John regularly on his saxophones with The Jazz ConneXion, a jazz trio. He is appearing for the first time as our TACO emcee. TACO “ROCKS OUT” AT THE LIBRARY Libraries are not what they used to be! TACO has been invited to play as part of a summer reading program “READING ROCKS” at the Mountain View Library. Among their creative events has been a night of rock painting and they’ve had several musical groups performing in their community room this summer. A small representative group of TACO, about 25 musicians, will bring symphonic music into their summer program, in the community room at the library on Tuesday, August 7th from 7 to 8 pm.